Do You Know Where Santa is Tonight? Christmas Eve is a day that holds a special place in many kids’ hearts – for some, it’s the presents, or the family and friends, or the music, or even the food – but for me, it’s always been about Santa Claus. The almost magical feeling that overcame my cousins and I when we were little kids and we’d go to bed swearing that there was no way we’d ever fall asleep because we were so excited for Christmas morning. Setting out the milk and cookies for Santa, listening for the sounds of the reindeer on the roof of my grandparents house (we always stayed at my grandparents’ house Christmas Eve night) waking me up – it was all kind of surreal for me. That’s a feeling that I’ll always hold close to my heart during the holiday season and I’m looking forward to sharing it with my kids too someday. That’s also why this time of year is one of my favorite times to be a Booz Allen consultant too. That’s because, for the last few years, we’ve had the privilege to have one of the most important jobs in the world – helping the North American Aerospace Defense Command (NORAD) track Santa Claus as he delivers presents to kids across the globe. For more than 50 years, NORAD has used the media and a special phone number to provide children worldwide with updates on Santa Claus’ location as he travels the globe on Christmas Eve. It all started back in 1955 after a Colorado Springs-based Sears Roebuck & Co. advertisement for children to call Santa misprinted the telephone number. Instead of reaching Santa, however, kids ended up calling NORAD’s Commander-in-Chief’s operations “hotline.” The Director of Operations at the time, Colonel Harry Shoup, realizing that kids were relying on him for quite possibly the most important information of the year, regularly checked the radar for Santa as he made his way around the world delivering presents. All of the children who called were given updates on his location…and a 50 year old tradition was born. Since then, NORAD has continued to track Santa’s annual flight, responding to children who call asking to find out where he is, what they’re getting for Christmas (sorry – the NORAD radars can’t tell if he has coal or presents in his sleigh), and when he’s coming to their house. 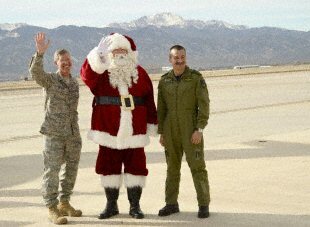 NORAD, much like Santa himself, has also started to make better use of technology too. In addition to being able to follow Santa using real-time Google Maps data, you can also join the more than 250,000 people who are friends with Santa on Facebook, get NORAD’s latest updates on Santa’s travels by following them Twitter, see where Santa has already been by looking at the photos of Santa on Flickr, and watch videos of his many visits around the world on YouTube. This year, help make Christmas Eve become a magical time for your kids too and show them the NORAD Tracks Santa website. Where’s Santa at now? I had never really thought about it, but NORAD’s Santa Tracker is a great way to help kids learn about geography. How are Boozers helping NORAD? Ari – Booz Allen has coordinated the effort to design and develop the NORAD Tracks Santa web site each year since 2007. This year, we developed and implemented their social media campaign, including all of the social media engagement described above as well. Also, on Christmas Eve, dozens of Booz Allen’s Colorado Springs staff volunteered at the NORAD Santa Operations Center on Peterson Air Force Base, answering phone calls, responding to emails and tweeting Santa’s locations! IMO, it’s one of the cooler social media projects that we’ve helped support. My hat’s off to our team out in Colorado Springs who helped make this project a success!